The first female jockey to ride a Melbourne Cup winner has made another breakthrough as the first woman to receive a rare Chairman's Award from the Australian Racing Hall of Fame. The award was presented to Michelle Payne at a Hall of Fame induction ceremony in Adelaide on Friday night. It was only the third time the Chairman's Award had been presented. 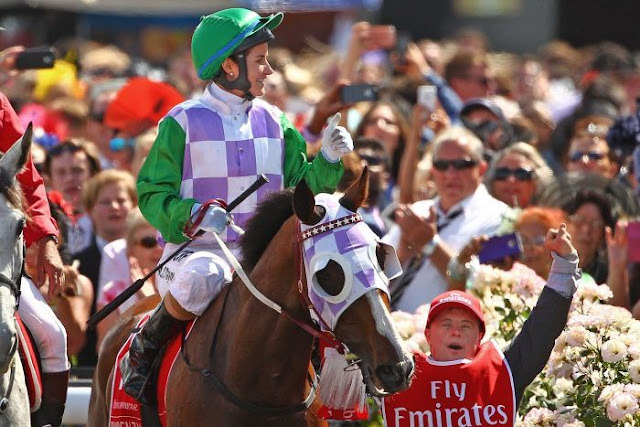 Payne's Melbourne Cup victory on Prince of Penzance was recognised for reflecting positively on Australia's racing industry. While receiving the award, Payne said the Cup had changed her life. "The last six months has been a bit of a crazy battle of trying to fit everything in and keep everyone happy and also still be a jockey at the same time," she said. "I've just done my best with everything and think we're getting through it pretty well and looking forward to when the spring time comes around and I can really focus on my riding and have another crack at the spring and the Melbourne Cup."